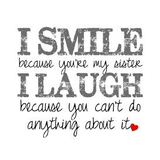 I smile because you're my sister I laugh because you cant do anything about it. 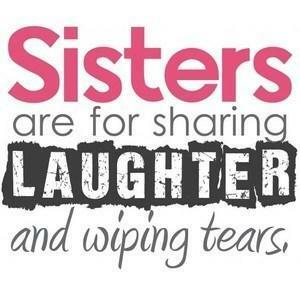 Siblings are the people we practice on, the people who teach us about fairness and cooperation and kindness and caring--quite often the hard way. Our siblings push buttons that cast us in roles we felt sure we had let go of long ago - the baby, the peacekeeper, the caretaker, the avoider...It doesn't seem to matter how much time has elapsed or how far we've traveled. Sibling relationships...outlast marriages, survive the death of parents, resurface after quarrels that would sink any friendship. They flourish in a thousand incarnations of closeness and distance, warmth, loyalty and distrust.